On April 1, 2014 a plea went out on Facebook looking for someone who could care for a kitty who still had his eyes shut and would need bottle fed. This little kitty was abandoned by his momma and would die if not fed soon. We knew we had to help this kitten. Having bottle fed baby otters, baby kangaroo, and experience working with a variety of exotic animals, and with a medical background in nursing, we took this little kitty into our home and instantly fell in love with him. This was the beginning. After this, we got many calls for help with rescuing animals in our community. 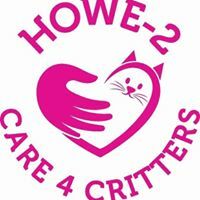 Howe-2 Care 4 Critters was born out of this great need. Since our inception, we have become a 501c3 non-profit organization helping hundreds of animals go on to survive and find loving homes.